When I verify an incomplete puzzle, I always hope that I made a mistake, but that never happens. 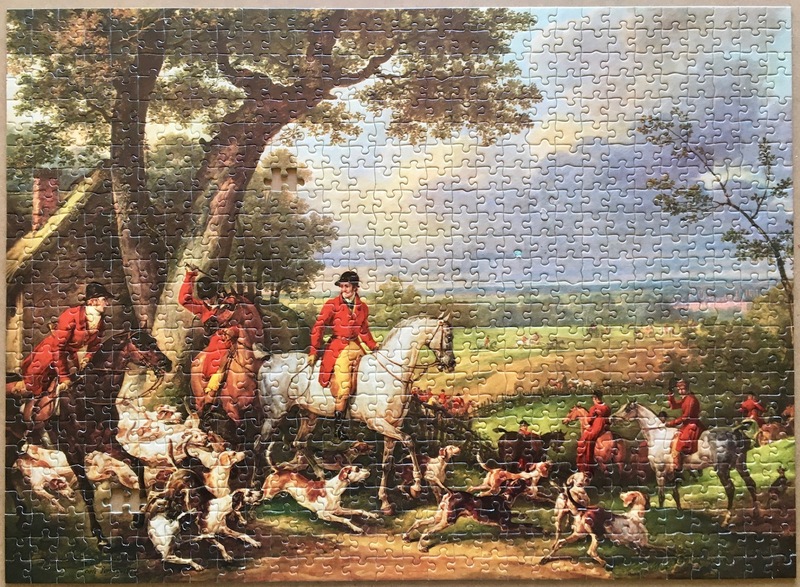 The Hunting near Fontainebleau had two missing pieces when I verified it, and it had two missing pieces when I completed it. It’s a shame, because it is a small beautiful puzzle that now will be added to the Missing Pieces repository. Carle Vernet lived and worked between the 18th and the 19th century. The hunting scene that he captured might look like something from the past. It is difficult to imagine that the artist could have painted it just last Winter. The Forest of Fontainebleau, which is only 60 km. away from Paris, is a very popular location for tourists. However, it has also been a hunting place for around 1000 years. They still hunt deer with horses and hounds, although following certain restrictions (only Tuesdays and Saturdays, from October to February). Apart from that, there is no major difference between the scene that Vernet painted two hundred years ago. We could see that same scene at the Forest of Fontainebleau in the present. These smaller puzzles are a good relief when you have been working for some time on a large or challenging puzzle. It is possible to finish in a couple of days and you have the feeling that you are making consistent progress. That compensates the frustration of hours without finding any piece when you are facing a bigger challenge. Hunting near Fontainebleau was a small and delightful puzzle. Although Nathan produced it in 1976, I was surprised to see how well the pieces have endured the passing of time. After 40 years, the pieces are in excellent condition, which is something that collectors appreciate very much. 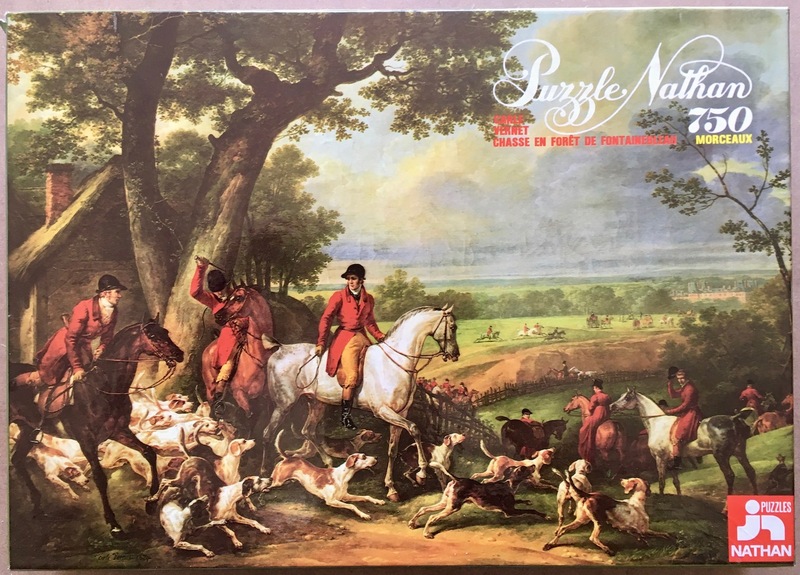 Ravensburger produced in 1978 a 1000 pieces version of this puzzle, which surely will also have great quality. If I am correct, there is a 1000 pieces version by Educa as well, but I have never found one yet. The puzzle will be part of the replacements section from now on. 750, Nathan, Hunting Near Fontainebleau, Carle Vernet, 58.5 x 42.5 cm, Reference number 551 174.